peace of Christ be with you. i just wanted to ask about telekinesis or moving things with our minds. is that real? if yes, is it with or against God’s will? 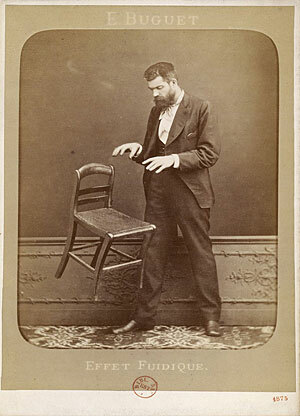 French spirit photographer Édouard Isidore Buguet (1840-1901) demonstrates telekinesis in this hoaxed 1875 photograph titled Fluidic Effect. Buguet was arrested the same year for faking his ghost photographs and he served a year in prison. Telekinesis (also called psychokinesis) is supposedly the ability to move or influence objects from a distance with some mysterious power of the mind or of the will without touching those objects. It is often mentioned by new agers in an attempt to “prove” their point that the human soul has some divine abilities, although such phenomena have no scientific basis at all. In other terms, so far telekinesis is just a superstition of the New Age movement that is based on wrong Eastern philosophies as we have seen in our article about yoga: What does the Bible say about yoga? If telekinesis has no scientific basis, then how can we explain the fact that some people move objects from a distance without touching them? Well, some of the supposed telekinesis shows were proven to be tricks similar to the ones used in any “magic” show. Others’ secret was not revealed, but we know from the Word of God that any paranormal phenomenon that involves any kind of lie or deception is from the devil, as the devil is the father of lies (cf. John 8:44). God says in His Word that any kind of magic or deception should be strongly avoided without any compromise, as it makes us enter in a kind of connection or agreement of lie with the devil (cf. Leviticus 19:31, Leviticus 20:6, Acts 8:9-13, Acts 13:6-12, Acts 19:19). Those who are in Christ have received the Spirit of truth (cf. John 14:16-17), and they hate all what is based on any kind of lie or deception. And as we have seen above, the New Age movement uses telekinesis and similar phenomena to preach its lies, and these phenomena have no benefit for humans or for godliness. So we should not encourage these lies. Jesus is God incarnate. He commanded the wind and the sea and they became calm (cf. Mark 4:35-41). He commanded the fish of the sea from a distance, and He even decided what one of them should have in its mouth (cf. Luke 5:3-9, Matthew 17:24-27)!! The New Age movement wants you to think that humans are gods like Jesus and that they can do the same things with a divine power in them! So will you believe their lies and will you participate in their works of darkness? This entry was posted in Questions, Religious Movements. Bookmark the permalink. Jesus also said with a mustard seed size amount of faith we can move mountains and his people were given power like jesus by him so why is magic/telekinesis considered bad. God says in His Word that any kind of magic or deception should be strongly avoided without any compromise, as it makes us enter in a kind of connection or agreement of lie with the devil (cf. Leviticus 19:31, Leviticus 20:6, Acts 8:9-13, Acts 13:6-12, Acts 19:19). Those who are in Christ have received the Spirit of truth (cf. John 14:16-17), and they hate all what is based on any kind of lie or deception. And as we have seen above, the New Age movement uses telekinesis and similar phenomena to preach its lies, and these phenomena have no benefit for humans or for godliness. So we should not encourage these lies. God says in His Word that any kind of magic or deception should be strongly avoided without any compromise, as it makes us enter in a kind of connection or agreement of lie with the devil (cf. Leviticus 19:31, Leviticus 20:6, Acts 8:9-13, Acts 13:6-12, Acts 19:19). So if thelekinesis would be a scientifically verifyable skill, part of human evolution, that is not using any lie or deception, but gifted to people to better the world and the lives of others and not to be used to their own gain, then it would be as a gift of faith, or accepted by God, or Christians? I have read a lot of explanations already, many of which were written by faithful christians about this topic, and it just more and more controversial. So I would be very thankful if you answered to me. Also please forgive me for any misspelling or grammatical failures from me, as english is not my native language. You have misunderstood my argument. The argument is not that telekinesis is wrong because it is not proven by science, but it is wrong because it is naturally linked to lies that are its causes without which telekinesis would not exist. I mentioned the fact that telekinesis has no scientific basis, because I wanted to stress on the fact that, besides being a practice based on a wrong human philosophy, telekinesis has no scientific basis; so the new agers who bring this practice as a proof for their beliefs are actually bringing a non-argument. Even if science proves something in relation with what is presently called “telekinesis”, that will not be what the new agers are preaching today. What they presently call “telekinesis” will never be proven as a scientific fact, because it is naturally anti-science in its principles. Let me put it in another way: There will not come a day when science will prove the philosophical basis on which the new agers build this principle of telekinesis. And even in a more simple way: there is nothing called telekinesis in reality. Science may only prove the fact that lies were behind this practice. I advise you to read the following article to which I already linked in the article: What does the Bible say about yoga? In that article, we have seen how all such practices do not really give or do what they promise or claim to do, but they are only deceptions with which new agers try to back up their false philosophies. So if thelekinesis would be a scientifically verifyable skill, part of human evolution, that is not using any lie or deception, but gifted to people to better the world and the lives of others and not to be used to their own gain, then it would be as a gift of faith, or accepted by God, or Christians? 1. Telekinesis will never be proven scientifically. And this is not my personal point of view, as you call it, but it is the teaching of the Bible, as we have seen: no lie can come from God. 2. There is no way by which a lie can better the life of anyone. 3. Even your supposition that it may be proven scientifically contains a non-scientific superstition: human evolution. Evolution is anti-science. You can read about this here. 4. Lies cannot be gifts of faith, because faith is not built on lies or superstitions, but it is built on the truth. Please, read the following article to understand on what faith should be built: On what should we build our faith? 5. Christians do not accept anything as truth other than what God says, whether in the Bible or in the nature that He created (and the revelation in nature agrees with the Bible and should not be interpreted with the fallen human mind, but it should be interpreted by the Bible), and God does not change His mind to accept things that He already rejected in His Word, the Bible. N.B. : Our faith is not built on dead letters written in a book called “the Bible”, as many people think about us, but our faith is built on a living Person who rose from the dead, Jesus Christ, the Son of the living God. So the interpretation of the Bible does not change according to the change of our opinions, but it is only the Author of the Bible who can interpret His Word; and this Author is alive, so no one should replace Him. Whatever disagrees with the truth that was revealed in Jesus Christ cannot be a true interpretation of His Word. Posted this on the ‘Yoga’ question so I thought I’d post it here as well since it’s relevent. Came across this post by accident, and YES I know it’s been a while since somebody commented but here goes.. No one can answer definitively whether ‘Yoga’ or ‘Telekinesis’ are bad, or evil or wrong for a Christian to participate in. No one can answer definitively that both are ‘good’ or ‘ok’ for a Christian to participate in either. There are just too many factors involved for there to be one all encompassing answer that applies to everyone on this. There are ‘spiritual’ atmospheres and practices in some Yoga classes that aren’t present in other Yoga classes. There are some Christians who are fine attending Yoga classes and some Christians who are susceptible, sensitive or even vulnerable to their perceived negative or even positive ideas of ‘Yoga’ no matter how ‘non-spiritual’ the class or exercises might be. Bottom line if you feel it’s wrong then for you it is wrong. Being wrong for one Christian doesn’t necessarily mean being wrong for all Christians. Other confusing aspects when we’re talking about things like Yoga and Telekinesis are firstly semantics and second the ‘mechanics’ behind act. If someone moves something supernaturally, does that mean it’s ‘Telekinesis’? Not necessarily. Only God and maybe that person know where the power came from. Was it faith? Was it mind over matter? Only God knows that person’s heart so only God knows their motive and the source of the power used. ‘Telekinesis’ more than anything is a popular but awkward word for describing this supernatural phenomenon but just because the word can have multiple meanings doesn’t mean its witchcraft. More important is what that word means to the individual and that they carry themselves according to that belief. ßWithin reason of course, remember God didn’t put a brain in our heads solely for weight balancing. Once again, ‘Telekinesis’ maybe not always the best word for describing this phenomenon in secular talk. Also it’s not always cut and dry and we Christians don’t have to know all the answers. Would you be more comfortable attending a Yoga class or eating food that’s been sacrificed to an Idol? Not so clean cut sometimes is it? You follow your feelings, and not what God says in His Word, the Bible. We have seen in both articles (about yoga and about telekinesis) the details about what God says concerning these sinful practices. As you follow your feelings, so you cannot answer those biblical arguments, therefore you prefer to make the whole matter uncertain… YES, we Christians CAN know the truth about yoga and telekinesis and all what is evil, in order to avoid them! We can know the truth, because God’s Word is the truth (cf. John 17:17). In the article about yoga we have seen how yoga encourages self-worship instead of self-denial, so it’s evil. By definition, a Christian is someone who has denied himself, so yoga is against his nature! And in the article about telekinesis, we have seen that all lies and deceptions come from Satan, and that a Christian by nature should not participate in any form of lie or deception, because he is not a child of the devil anymore, but a child of God. A child of God does not believe in superstitions, so he doesn’t assume like you that these practices may have something good in them… He doesn’t assume and imagine, but he KNOWS the truth, because God’s Word is the truth. If you are a true Christian, then you will read the Bible and you will see these things clearly. Yes, God knows if there is a good power in telekinesis, and He has already declared it in His Word, as we have seen in the article about telekinesis. Hello, Im a little confused. I am a christian, and believe in GOD with all of my heart and soul, I also believe that Jesus died for my sins, and was in fact, the son of God. Im just not sure that I agree with what your saying. I believe that the entire bible is fact, not a doubt in my mind. I know that everything is written in stone for us. But, I also believe that humans only use a small fraction of the brain. If we were able to use our whole brain who knows how intelligant we would be or what we could be capable of. I think telekinesis possibly could be the result of using a little bit more of your brain then the average person, and if thats the case, I wouldnt consider it “magic” or “deception” or even “lieng”. The article gives the details about why telekinesis is a deception. The sole fact that you assume that if we use more of our brains then we may do supernatural things is a deception and a superstition. The Bible is clear about this issue, as we have seen. If you’re truly a Christian born of God, you won’t believe in superstitions, but you will only believe what God says and what agrees with His Word. A quick note: Jesus not only was the Son of God, but He IS the Son of God. But can you please share why you couldn’t save yourself from your sins and you needed Jesus to save you? i had a very long reply back to you, but i deleted the whole thing because im better then you. and i dont need you to minipulate me, or anyone else for that matter. rock n roll brother. go to church. Not suprising considering practitioners of your faith during a period in history hunted and murdered people(publicly and under consent of law) exhibiting strikingly similar traits to telekinetics/psychokinetics, and they had the assumption that they were evil. It’s ironic though, a young christian I specifically remember sent me a message saying how interesting he thought my videos were, so I guess you don’t speak for all christians, but it seems you’re trying to…. Quite frankly, from my persepective, as a telekinetic myself….I view this as pretty hateful, and it’s a message to your own group to also hate people like me. But do please visit my page and at least watch my hado rice (prayer) experiment, it’s sort of like a scientific experiment on prayer(or whatever you choose to call it, directed vibrational frequencies?) and I should warn it’s sort of “new agey” though I’m not really religiously tied to “new age”. Let me make my thoughts on christianity clear though, I see much truth in the book, it just takes a lot of wisdom to really understand it, and my opinion is that most practitioners don’t understand half as much as they claim to and it is shown by their hypocrisy of actions in breaking their own rules, such as judgement of others to damnation of hell, and lieing(or making ignorant claims at least if I give you the benefit of the doubt)….about there being no scientific proof of telekinesis, well I undertook the task myself with very limited resources and only got up to the part of doing it while contained(had live witness not recorded). Then another practitioner of tk I know took the next step and did it in an enclosed partial vacuum, he stopped a crooke’s radiometer while it motion with a test control still spinning under the same light right next to it. (his video is in my favorites section user ShirakOmega on youtube). There seems to be some kind of mainstream coverup that brushes the subject off as fake and scam immediately without any consideration, so the scientific community(mainstream at least) just ignores the subject mostly, so that’s why people like us are forced to produce as much proof as we can on our own limited budgets…. So basically you are just wrong… and pretty much a liar… Ironic because you say the same about us….Sorry if I didn’t come across as too friendly, I’m sure it doesn’t help the telekinesis image, but I was a little offended when reading this. Oh and one more thing, look up the Egely Wheel, a scientist invented the gadget for reading the strength of your “telekinesis”. First, I am so sorry that we can’t post your link on our weblog, because it contains some bad things and we can’t expose our readers to that. Those who are interested in lies will surely be able to find your videos on YouTube. So I hope you also will soon repent and get rid of all those things related to telekinesis, including those YouTube videos that you boast of. Unless you do that, you can’t claim to be a true Christian. One day you will stand before Christ to give an account about this and similar deceptions. I have seen the titles of your videos, and it was interesting to see one of those titles containing the word “trick”… Indeed, that was our main argument in the article: That those are just tricks, and that a Christian should not have any relation with anything that contains a lie or a deception. When you know it’s just a trick, don’t say it has some scientific reality behind it. Telekinesis follows this same philosophy, as you yourself admitted when you talked about prayer and about your views of the Bible. I have previously clarified that we don’t follow the opinions of those who call themselves Christians, but we follow what God says in the Bible. So your argument that you also are a Christian is just a waste of time. Even you yourself admitted that you don’t really believe the Bible, but you add to it your own personal interpretations, thus refusing to obey God. You follow your personal opinions, and not the Word of God. Welcome again to our blog, but please think well about what I told you here. Well its interesting to see how people find out something and they have no explanation for it, and they create one in order to prove their interesting thing has merit. They will let themselves dream up wild explanations because the thing they discovered MUST be true. This is why we need the Word of God to prove all things whether they be of God or not. Jesus said we are either FOR Him or AGAINST Him. There is no middle ground, whats ifs, etc. We are told plainly and clearly in the Word what is right to follow so that we dont get fooled by everything that comes along under the sun. But people use vain imaginations to cook up explanations because it feels right to them. There it is – “feelings”. even in churches, so many go by feelings and not correct doctrine. That is why there is crazy preaching and crazy things happening, even signs and wonders that IF IT WERE POSSIBLE could deceive the very Elect.. but it is not possible to deceive the very elect. The Holy Spirit will let us know what is true or false. What if you do not think of telekinesis as a form of deception or magic? What if you think of it as being able to understand yourself better, and using the abilities that God may have given you? Do you also think that meditation is wrong, and that it might not be a way to understand better and therefore be more grateful for the world and everything that God has given us? I say this because I believe these two things to be connected, and yet do not see the wrong in them as others do. I think that God has blessed us all and that the wonders He has created within us are endless. Please forgive me if I seem ignorant towards any of these topics (since I am only 14), I just wished to share my view and hear what you think of it. Thank you for sharing with us your view. We have seen in this article and in the articles to which we have linked (especially the article about Yoga) that real meditation does not go inward but outward, to God. Yes, we are wonderfully made, but we are now corrupted by sin, and the only way to know the truth is by being in a right relationship with God and by meditating on His Word. I pray for you that you may be reconciled with God by faith in the Lord Jesus Christ (if you have not yet). You need the forgiveness of your sins; you need to be cleansed from all your sins. You need to repent and believe in Christ. This is how you will know the truth. You know, I think its kinda strange how some ppl can call themselves christians and not know the bible. I know for a fact that we can do anything through Christ. The miricals that Jesus performed… Do you think he did all that only to prove he is who he says? I guarantee if He show up here today not one of us would beleive that he is who he says. But I hear christians saying all the time, “that’s not possible.. that can’t happen”, “God did not speak to you”, and so on. Jesus says it himself that we can do anything through faith in Him but when I do just that I get skeptism from my fellow christians lol. However, I do beleive that anything based on lies is wrong; magic, psychics, ect. If there is no need for it you will not have it. Take Moses parting the red sea for example. From experience I know anything and everything is possible it wouldn’t even be a thought if it wasn’t. As far as telekinesis goes… (lets not call it telekinesis.. i’ll say, “moving objects with your mind”) it is real. 1. Your comment shows that you yourself do not know the Bible well, so it’s strange that you accuse students of the Bible of being ignorant of the Bible. 3. Telekinesis is not a miracle, so I don’t see how you compare it to the miracles of the Lord. 4. The Lord said that false prophets will do false miracles in the last days. For the rest, read the article; we have explained it all.